The dilemma: You want a pair of high efficiency stereo/HT mains that will give you 99dB/watt sensitivity down to 80 Hz. You don't have room for large horn-loaded enclosures, you can't afford to spend a lot of money, and your woodworking skills are too rudimentary to build a complicated cabinet. The answer: TLAH. The TLAH combines the features of line array, transmission line and horn-loaded enclosures in an easy to build cabinet. Only 40 inches high, and extending less than eight inches into the room, these speakers project a huge soundstage similar to that formerly available only with large horns. The triangular version shown may be mounted a room corner, or hung mid wall. 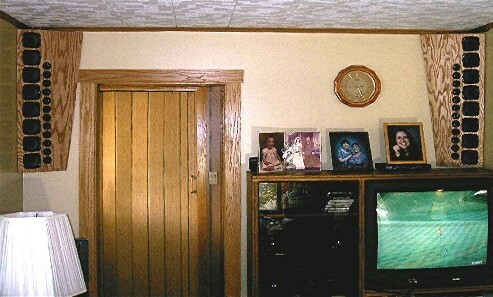 The rectangular version may be wall hung or floor standing. Both versions are included in the plans. Either makes a perfect main speaker system to compliment any of our home theater subs. Performance rivals commercial speakers that cost even thousands of dollars, but they can be built for less than $150 apiece with commonly available drivers. If you're lucky enough to find closeout drivers you can build them for even less. The originals were built at a total cost, including lumber, of $60. For the pair. End of dilemma. Plans are $14.95, delivered within 24 hours as email attachment in MS Word format. 21 Pages, 48 Pictures and Diagrams. PDF available on request. Also included is a 3D model of the cab that allows you to see every part in the closest detail. The Pro version of TLAH uses eight 8 inch woofers and eight tweeters in an oversize version of the HT model. Standing six feet high, it may be made triangular for built in tilt down and toe in for fixed installation, or rectangular for fixed or portable use, wall hung or stand mounted. Both versions are included in the plans. Usable response extends to 50Hz, so it may be used without subs if desired. With 102dB/watt sensitivity, and the long-throw clarity than only a line array can give, this speaker is especially well suited for permanent installations in acoustically harsh environments, such as churches and gymnasiums. Plans are $14.95, delivered within 24 hours as email attachment in MS Word format. 23 Pages, 53 Pictures and Diagrams. The TLAH and TLAH Pro are separate plans. If you want the TLAH Pro be sure to specify on your order TLAH Pro, or you'll be sent the standard version.